Muddle the syrup and mint gently in a Collins glass with a barspoon. Add ice and build remaining ingredients, mineral water last. Stir once. Rub a spent lime hull on the rim of the glass and throw it in. When muddling you want to be gentle. Too much and the mint will release it's oil and then turn to mush which gives the drink unwanted vegetal flavors. Havana Club Anejo Blanco (the real one from Cuba not the Bacardi knockoff) is the rum to use if you can get it. If you can't, use a high quality white rum such as Ron Matusalem Platino, Flor de Cana 4 Year Extra Dry or Plantation 3 Star. I like to use mineral water but any fizzy water will do fine. As far as ice goes, you want to use cubes or big lumps of ice. This drink is pretty watery to begin with so you don't want a bunch of crushed ice melting out before you finish your Mojito. Big lumps of ice are also nice if it's warm and you want to linger with your drink. If you don't have any fresh mint, you can use a spearmint syrup instead of the simple syrup. This does not quite make the same drink, but it is pleasant nonetheless. 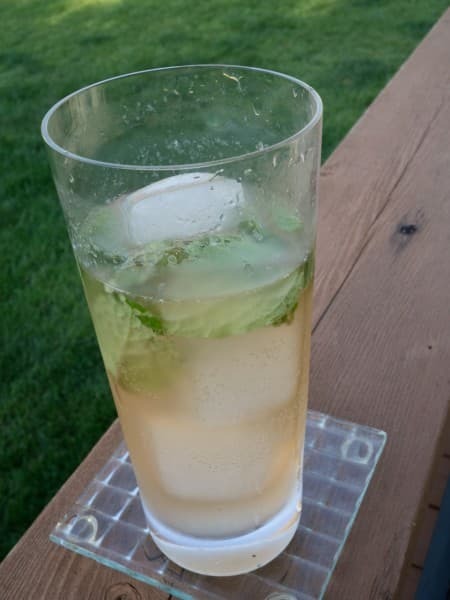 Using mint syrup can also be helpful if you have enough mint to garnish but not to use in the drink. In the Havana bar in Cuba (and at a Cuban bar in the Cayman Islands) they add a dash of Angostura bitters to their Mojitos. I prefer this version but if you like you can leave out the bitters.